The abbey was dissolved in 1792. In 1793, following the death of Louis XVI, Deputy Barère demanded the destruction of the “monuments to feudalism and the monarchy” in Saint-Denis. Thus the Revolution launched an attack on the symbolic powers of vestiges of the Ancien Régime (two centuries before the French Revolution). France was at war and needed metal for the manufacture of weapons. The lead roof of the Basilica was melted down, as were several metal plaques and tombs. In Saint-Denis, it was not the angry populace which carried out the destruction, but the government, the Convention, which in August 1793 hired an entrepreneur and workers to dismantle the tombs and destroy some of them. 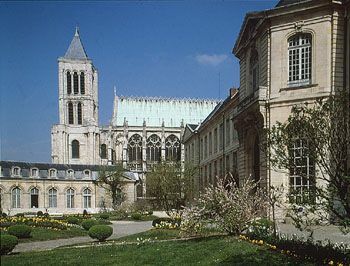 In the autumn of 1793, the royal remains were exhumed and put into two mass graves excavated in the cemetery to the north of the abbey church, land which is now the Jardin Pierre de Montreuil. Armed with picks and crowbars the workers attacked the coffins. An official report on the exhumations was drawn up by a former Benedictine monk from Saint-Denis, Dom Poirier, a scrupulous and detached witness of the events. The first remains exhumed were those of Henri IV. The Vert-Galant was so well preserved by natural mummification that he was put on display for two days by a pillar in the crypt. Louis XIV was as black as ink. Louis XV had been carefully wrapped in linen and strips of material and seemed to be in good condition. But as soon as the body was lifted out it dissolved in “liquid putrefaction”. Today, none of these tombs contain any remains. After the exhumations the abbey became a storage warehouse. Chateaubriand, in his “Génie du Christianisme”, describes the ruin: “Saint-Denis is deserted. Birds fly in and out, grass grows on its smashed altars and all one can hear is the dripping of water through its uncovered roof”. The desire, never fulfilled, of Napoleon I to be buried there prompted restoration work to be undertaken from 1806. Services were resumed in 1802.